NIA-CHARLESTOWN NEVIS (May 12, 2011) — Coordinator of the Inter American Institute for Cooperation on Agriculture (IICA) in St. Kitts/Nevis Mr. Augustine Merchant stressed the critical need for an increase in agricultural production and productivity in the Federation when he quoted statistical information from an International Monetary Fund (IMF) Report. Mr. Merchant brought the issue to sharp focus when he addressed participants at a two-day Greenhouse Management and Production Workshop at the Department of Agriculture’s conference room on Thursday. 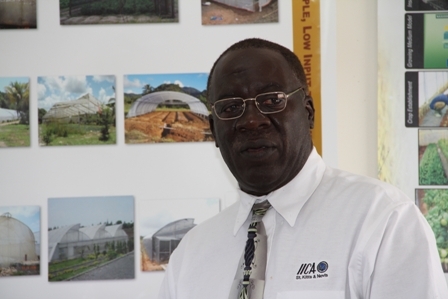 He said IICA was pleased to be associated with the workshop, which marked a new chapter in the history of agricultural development in St. Kitts and Nevis. “I wish to draw to your attention two vital pieces of information from St. Kitts and Nevis. According to the IMF, with 2000 as the base year, the Consumer Price Index of St. Kitts and Nevis has increased by 30 percent over the period 2000 to 2008. “Secondly, despite some marginal increases in food and meat production in recent years, the country imports more that 705 of its annual food consumption needs estimated at approximately US$42million in 2007. These statistics do not sound too good for us. There is therefore a critical and urgent need to increase agricultural production and productivity in St. Kitts and Nevis,” he said. Protected agriculture Mr. Merchant contend, could produce four times the amount of food production and in small states such as Nevis there were competing activities for the available land. According to the IICA Coordinator, technological innovation was a priority area for development and the Caribbean Agricultural Research and Development Institute (CARDI) had been mandated with the task in the Caribbean Community (CARICOM) to increase agricultural production and productivity. He noted that his Organisation had similar interests in the area of research and development and had similar countries that were member states of both institutions and had agreed to work together. “These two institutions have recognised that their collective efforts can provide a more effective contribution to agricultural research and development in their common member states of the Caribbean and that could otherwise be achieved by separate and independent actions of each party. “It is within this context that IICA and CARDI signed a Technical Co-operative Agreement to implement the Agricultural Research and Development Agenda of the Caribbean Region,” he explained. 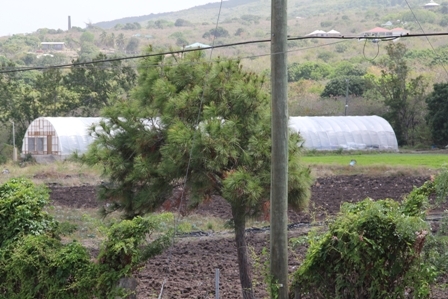 Under the Agreement his Organisation provided $10,000 for a shade house which has been erected at the Government Farm at prospect. The facility cost a total of $150,000 with funding of $140,000 from the Nevis Island Administration. Mr. Merchant added that the Agreement also made provisions for a firm platform for the implementation of IICA’s technological innovation Agenda in the region. Implementation of the Agreement he noted, would contribute to the achievement of sustainable development of agriculture, rural prosperity and food security in the Caribbean region through the promotion of innovative technologies for the modernisation of agricultural and rural sectors.